Yesterday, America remembered its fallen defenders of freedom. There were parades, wreath layings, and of course, barbeque-ing. Here in Chicago, the weather was dreary but that did not stop the hard-core picnickers to go to the lakefront. When I first came to this country, I did not understand the logic behind this holiday: only that friends would invite me to their home and eat. We have something similar in my country, April 9 or Bataan Day, when General Douglas McArthur and 80,000 of his troops (67,000 Filipinos, 1,000 Chinese Filipinos, 12,000 Americans) were held up in the last bastion of resistance in the islands of Bataan and Corregidor. Back home the celebration was more subdued; just wreath laying by the President, no bbq-ing. I took many things for granted back then: freedom, temperate weather, household help, parental advice, etc. Then I matured, got sick, recovered, and got sick again; as if God was trying to teach me a lesson. Well, I learned for sure, and beyond not taking things for granted; I learned about helping others not take things for granted. Of course, there is an easier way to learn this simple thing without having cancer, but that is not how my life is defined. I still don’t know what the future holds for me but one thing is for sure; cancer does not define my life. It is part of me as much as love, freedom, respect, etc. It is no longer a disease after a while it becomes part of my value system. Dr.J: Not the basketball player. This Friday, I have an appointment with Dr. J, a hepatologist at University of Chicago, to consult on the cause of my ascites. Although, it has not been bothering me and the last time I had fluids drained was April 11, I still want to know the cause of my ascites. Dr. J will be among my growing list of doctors I have come to see, and hopefully become friends. P.S. My wife and I did four miles again over the weekend. I struggled considering I had chemo five days earlier. ishing is one of those sports that lets you commune with nature. I never got “hook” on it (get it, hook). Probably because I would not know where to start e.g. lure, pole, fishing place, etc., but man has been fishing since the time of Christ. The apostles were fishermen. 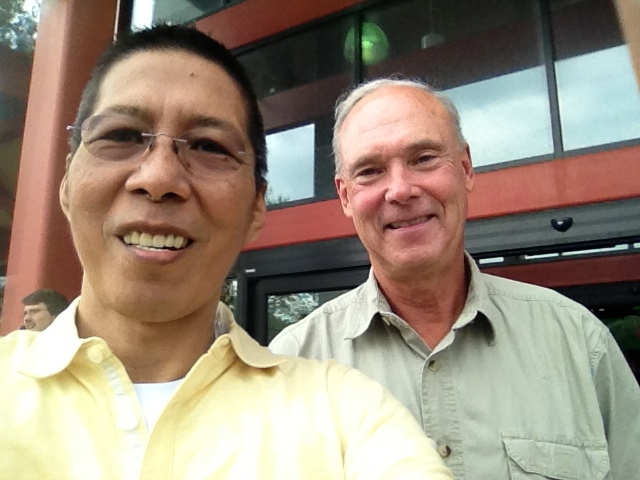 Recently, my former director, BobP, came for a visit on his way to Wisconsin for some serious fishing. He and his friends have been going to Wisconsin for more than 20 years. Bob says it is the spawning season of white bass so they catch a lot of them. They rent a small cabin and a boat, then fish in the morning and afternoon. Since he has been doing this for a while with his buddies he has lots of stories. We laugh, caught up with other friends and colleagues, and bonded. That is what’s all about. Before he retired, I did not know he was an avid fisherman. All I know is I dread being on conference calls with Bob because he asks intimidating questions, which brings out the best in me. You got to be on top of your game with Bob because he expects no less. I have to thank him for improving my writing too. I have seen him red-line audit reports that would obliterate the weak of hearts. He has a huge impact on me and I am still overwhelmed he took time to visit. Now, he is making me think about learning to fish–perhaps with Ethan. Yeah! Where you are is where you want to be. I did 4 miles of running yesterday. It is not exactly marathon pace but it was my first time to hit the trails. I just want to be out there. It surreal to go through the motion of preparing for a run. I had to dig out my GPS watch, compression socks, hat, and dry-fit tees, which hasn’t been touch since the Berlin marathon last year. Oh how my legs complained from the effort but I did not stop. I started slow until I got into a comfortable pace (14 minute-mile) and muscle memory took over. Runners and bikers were passing me but I was in my own world; a place where I want to be. That phrase stuck in my mind throughout my run: Where you are is where i you want to be. Tracy (my yoga teacher) said that during class as she instructed the class to bend forward and touch our toes. It was difficult since my body was stiff from all the inactivity and treatments I got. It does not matter, she said, if you can’t touch your toes, where it stops is where you want to be. I returned to the familiar trails of the lakefront because that is were I want to be. In the same context, no matter how I hate it, this Tuesday I will have my chemo again. I want to be there for many reasons. It is not about the choice; it is about where I want to be, not where I have to be. It is a place in your mind where you are at peace. Find it and go because that is where you want to be. Yesterday was Mother’s Day. So I started my day with a phone call to my mom. She is in Manila right now but will be coming to the US for a visit. I am so lucky that I still have my mom around for she has been a guiding force in my life and while I was growing up. Being first born I was dotted upon by my mother. At times, she still does it once in a while like promising to cook my favorite dish when I come for a visit. Lately, she has this thing about never ending mass offerings for my continued health. I always make a joke that my name has been called so often during prayer offerings at her church that I deserve to be cannonized or at least a statue. One time I attended mass at her church and it seems half the church knows my name and my cancer story, and I don’t even know them. She has tremendous faith and when I took a turn early this year, I could not bear to disappoint her nor tell her. More so, I carried this guilt that I will not be able to see her and do proper goodbyes, if ever. I was more worried about her when things are left unfinished. But now, I am on the road to recovery again and Mother’s Day to me has a different meaning. I often said that each day is a gift and should be appreciated; Mother’s Day or not. Important relationships should be renewed with righteous meaning. If you look at it each day is unique and brings unique opportunities. I am not the same person last Mother’s Day too. Last year is gone and even yesterday, a memory. What is important is now, you, me, and this moment. Aside from my mother, I should pay tribute to another strong woman in my life, my wife. I am in awe how my wife has managed to keep my family together, balance her nursing career, and satisfy my needy medical needs. I must admit I am not an easy person to get along with when I have my moments. Chemo treatments does not make it easy when I am totally stubborn and insensitive. But she sees beyond this, she would come home from work with vivid stories of patients far more advance with their cancers or patients who have neglected themselves or by others. Sort of telling me that I am blessed in my current predicament. I am blessed. I am surrounded by strong women who looks after me. I even have strong women-friends who can beat the sh*t out of me. Yeah, you know who you are…hehe. So I am back doing chemo treatments again. I started up again last Tuesday. Somehow, chemo has become part of my lifestyle along with all its side-effects. I no longer complaint about it but have come to accept the necessary inconvenience it causes. Some people hate traffic congestions and other pet peeves; mine is I hate chemo the most. In the past, I tried to demonize it hoping it will go away but it didn’t. Now, I just look at it as my new normal or part of my life. Why make it any bigger than what it is already; just accept it and move on, right? P.S. Thanks to my friend MikeE who sent me training materials on Python in DVD. Have you ever tried studying when your brain is soaked with chemo; not good. he news of the result of my PET scan was quick. Two hours after I have left the hospital, Dr. B called the house and left a message. Dr. B is the head radiologist at the hospital, and he and I got to know each other well (see related post on August 22, 2012, “A different kind of relationship: the results“). “Hi Dr. B. It is Bo.” After the pleasantries he gets to the point. He had an optimistic tone in his voice and like many times before he choose his words carefully. It means I made progress in stabilizing or shrinking the tumors in my lungs. Thank you. It also means, more work (chemo) ahead of me. The scan also picked up my ascites but he ruled out carcinomatosis or peritoneal metastases, which gave me the poor prognosis last January. Dr. B suggested for me to see a Hepatologist for the ascites: Great more doctors. “So what’s the plan, doc?” I asked anxiously. My wife and I were to the discuss the results of my scan and my treatment plan. However, in the back of my mind I know what he is going to say: more chemo. There is really no choice with this disease. I need chemo to keep me alive, like plants need water to survive. He tells me that he plans to give me a break first before starting up. That’s a relief but then I tell him of my June travel plans. He then tells me that I should do two or three cycles of chemo before traveling and that we should start it soon. Oh, well. You got to put in the work first before you can enjoy, which is how my life works, and should work for us too. Back to work for me. P.S. I start chemo again on Tuesday, May 7.